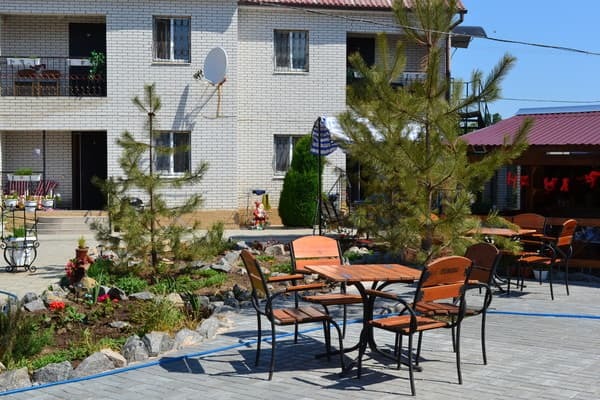 Mini-hotel "Maxima" is located on the territory of the balneological sanatorium "Kirillovka", in its park zone, 150 meters from the beach. 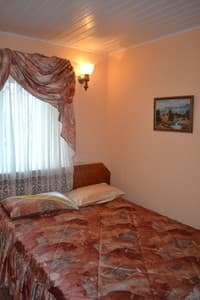 The hotel is presented by comfortable 1-, 2- and 3-room rooms of various categories. Each room (50 sq.m.) 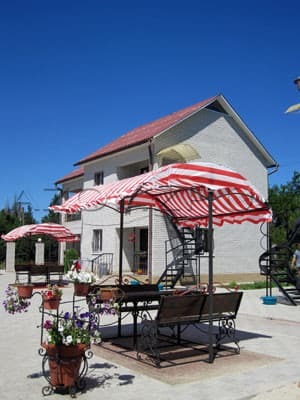 has a separate entrance, veranda or balcony, two separate bedrooms, a hall, a kitchen, a bathroom (shower, washbasin, toilet). 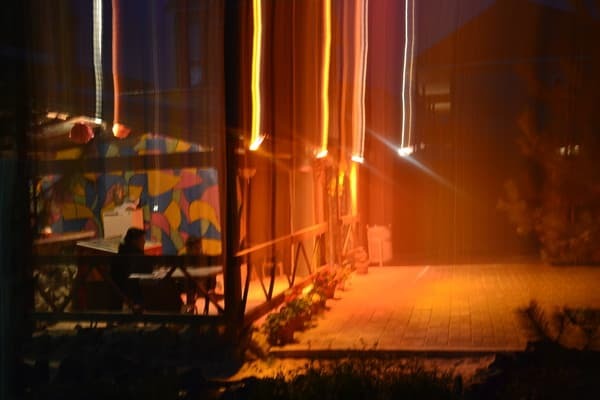 The Maxim Hotel has a mini library, a children's playground, a children's pool, free parking, a Wi-Fi zone, and a shuttle service to and from Melitopol. Description of the room: One room with an entrance hall and a bathroom. The room has a double bed, table, chairs, chest of drawers. 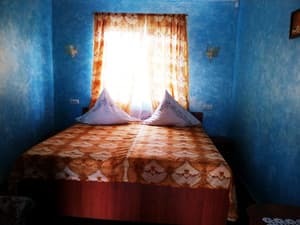 Description of the room: Double bed, one-and-a-half bed, table, bedside tables, cabinet hanging, floor clothes hangers, dryer, bed linen, set of dishes. A bathroom complete set. Description of the room: One room with an entrance hall and a bathroom. In the room there are two double beds, table, chairs, chest of drawers, wardrobe, TV, refrigerator, kettle. 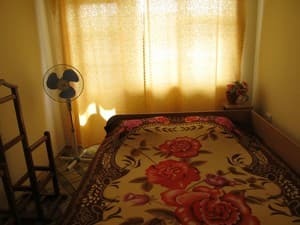 Description of the room: In a double room there is a double bed, table, bedside tables, locker hinged, floor clothes hangers, refrigerator, kettle, fan, dryer, bed linen, set of dishes. 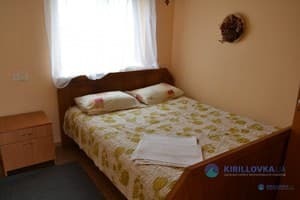 In the 4-bed room there is a double bed, two single beds, table, bedside tables, cabinet hanging, floor clothes hangers, refrigerator, kettle, fan, dryer, bed linen, set of dishes. A bathroom complete set. Description of the room: One room with an entrance hall and a bathroom. 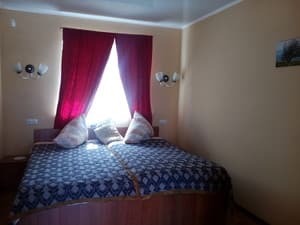 The room has a double bed, sofa (extra bed), table, chairs, chest of drawers, TV, air conditioning, refrigerator, kettle. Description of the room: One room with an entrance hall and a bathroom. In the room there is a double bed, sofa (extra bed), table, chairs, chest of drawers. Description of the room: Hall with upholstered furniture and satellite TV, two bedrooms with two beds (in one room there is a double bed, in the second there are two sesquises), a set of bed linen, a set of towels, a kitchen (electric oven), a complete set of dishes, air conditioning (in the rooms on the second floor ), balcony (veranda). Extra bed - sofa bed. It can accommodate 2 people. 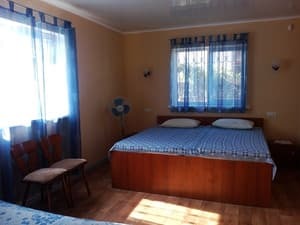 Description of the room: Hall with upholstered furniture and satellite TV, two bedrooms with two beds (in one room there is a double bed, in the second - two single beds), bed linen, kitchen, a complete set of dishes, a balcony (veranda). Extra bed - sofa bed. It can accommodate 2 people. 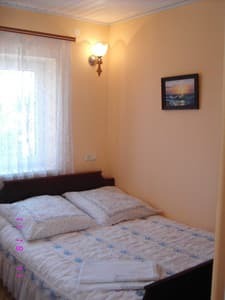 Description of the room: Hall with upholstered furniture and satellite TV, two bedrooms with two beds (in one room there is a double bed, in the second one there are two sesquises), a set of bed linen, a kitchen, a complete set of dishes, air conditioning (in the rooms on the second floor), a balcony (veranda) . Extra bed - sofa bed. It can accommodate 2 people. Description of the room: Spacious three-room suite with balcony (veranda). 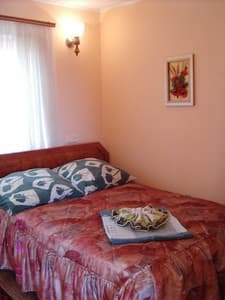 The room has a lounge with upholstered furniture and two bedrooms with two beds (in one room there is a double bed, in the second there are two sesquises), a kitchen (electric oven), a complete set of dishes, air conditioning (in the rooms on the second floor), a set of bed linen, towels . Extra bed - sofa bed. It can accommodate 2 people. Все понравилось. Все чисто и комфортно. К морю 10 минут. Неплохое расположение отеля. Близко магазины, базар. До пляжа надо пройти, но это не напрягает. Приветливый и отзывчивый персонал. В номере санузел, телевизор,холодильник, кровать, состоящая из двух соединенных между собой, wifi есть, но подключиться к нему не удалось. Как выяснилось кондиционера нет, вентилятор арендовать тоже не удалось, хотя на следующийадминистратор сказала, что они были, из 4х светильников работают 3. Когда мы приехали посмотреть номер ключей от него не оказалось в наличии и нам пришлось ждать часа полтора. Самое приятное - стены из газобетона - так что вы будете знать обо всем, что происходит у ваших соседей, а они будут слышать вас. "Стоянка" за територией отеля. Были 17-19 июня 2016. Всем довольны, до пляжа 100 метров, персонал адекватный, в отеле можно вкусно поесть за очень небольшие деньги. Children under 3 years of age without extra beds are accommodated free of charge. Accommodation on an additional place is 50% of the cost. There is an opportunity to order meals according to the menu to choose from (traditional Ukrainian cuisine, fish dishes), as well as diet food. 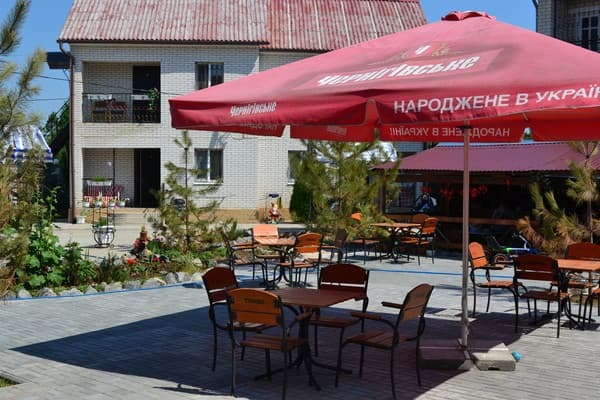 Estimated cost of complex nutrition - 200-220 UAH On the territory of the hotel "Maxima" is equipped with a summer kitchen for self-cooking. 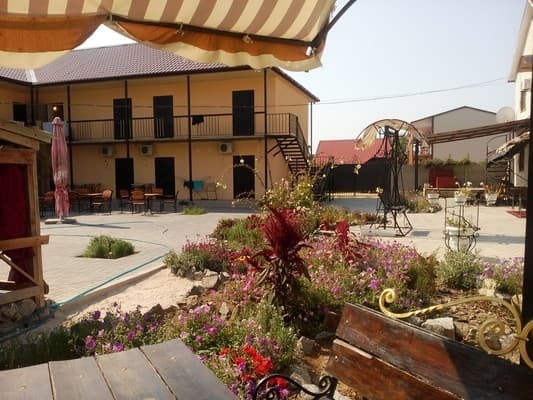 Mini-hotel is located on the Sea of ​​Azov in the village. Kirillovka, on the territory of the balneological sanatorium "Kirillovka", 150 meters from the beach. 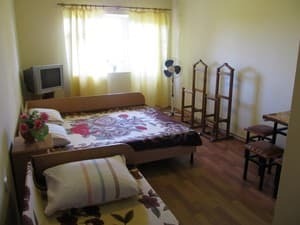 The mini-hotel is located on the territory of the sanatorium "Kirillovka", where it is possible to undergo a course of rehabilitation. There is also a physiotherapy room.